External GPS Loggers are available in a variety of different types. Some are completely independent of your camera and record your current location on a timed interval, some are triggered to record the location by the camera when a shot is taken, and some can even communicate with the camera and record the location data in the photo as it is taken. As I started researching these different models, I was attracted by the Jobo Photo GPS (hotshot style $150), but many bad reviews dissuaded me (poor quality, falls out of hot shoe). By far the largest class of loggers is the ‘large pack of gum’ style. You simply turn them on and attach them to something (camera strap) with a clip and off you go. These are getting smaller, but are still limited by the need to pack a fair amount of battery power for the GPS. 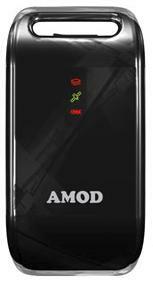 I read a lot of reviews and zeroed in on the AMOD AGL3080 ($65). The Amod’s major selling points are that it stores its track log data in the standard NMEA format and that it requires no additional drivers or software to transfer the logs to your PC (or Mac). You simply plug it in via mini-USB and it appears as a removable storage device (acts like a thumb drive). The unit has two buttons (on/off and mark) and three indicator lights (on/off, storage full, and GPS status). The Mark button allows you to manually create a data point say just before you enter a building where GPS coverage may be lost. By default the unit records a data point every second and although you can change this frequency, I saw no need to bother. Once you have a log recorded in the Amod, you connect it to your PC and simply copy the log. 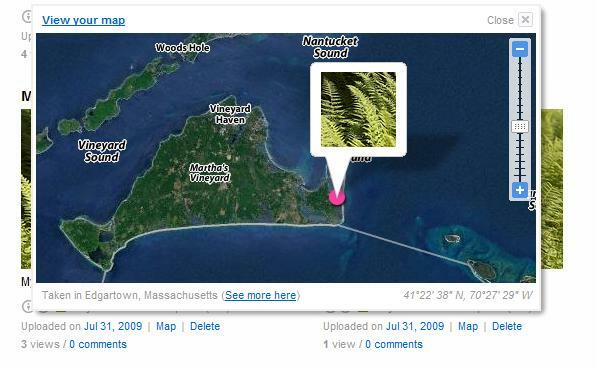 Now comes the fun part where we combine this GPS data with our photographs. This is done with some special software that can match the time a photo was taken with the time provided by the GPS system for each data point we logged. This will generally work best if your camera’s clock is correct (synched to the actual time), but it’s not a necessity if your software has the ability to compensate for any differences (apply an offset). I shoot with a Canon camera and use the EOSUtility software to set the camera’s clock to synch up with my PC. Yes, I hear you saying, what about the PC? Most of the recent OSs have a built in option to keep the internal clock in synch with the Internet Time Servers, but it’s easy enough to perform this manually if yours does not. Of course the first time I used the Amod logger my camera was off by a bit over an hour (DST strikes again). The good side of this problem was that it forced me to figure out how to apply a clock offset to the data so the software could match them up correctly. 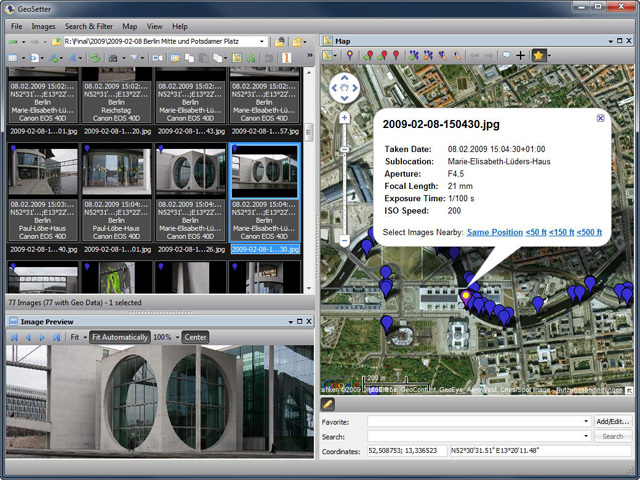 The last piece in this process is the geotagging software. The Amod comes with some software, but this was quickly rejected as it can not update images shot in the Raw format. The next two contenders were RoboGeo and GeoSetter. Both can update Raw images and both have very good reviews. GeoSetter is free, while RoboGeo costs $39. I am currently using GeoSetter and am satisfied enough that I haven’t even tried RoboGeo. Actually GeoSetter is VERY good and I couldn’t be happier with it. GeoSetter is feature rich and the developer is very responsive (he does accept donations). I like this last step as I may not want to publish the exact location of some photos (like inside my home). I can see some occasions when I won’t bother with the Amod Geotagger, but it will become a part of my normal outdoor shooting procedure. 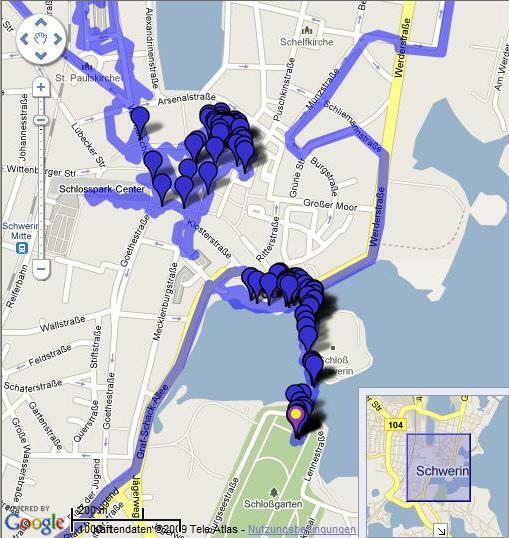 I tried using the GPS in my smartphone to create a usable track log. This required some additional software to create the track logs (Efficasoft GPS Utilities around $30) and the output format was non-standard. I had to convert it using GPSBabel (free). I soon tired of the extra steps and complications. The Amod in combination with GeoSetter is so quick and easy that for me to consider an alternative, it would have to have to be built into the camera. Always keep your camera’s internal clock set correctly. It’s so much easier to tag the images when the times match. The GeoSetter software does a great job. Even if you have it turned off for a few shots (or went indoors), it will interpolate along your track and add the “guessed” locations. Always do the Geotagging first when you are shooting in RAW. You want the location data in the Exif before you render your JPEGs. When you Geotag inside of a home you may be creating privacy/security issues. 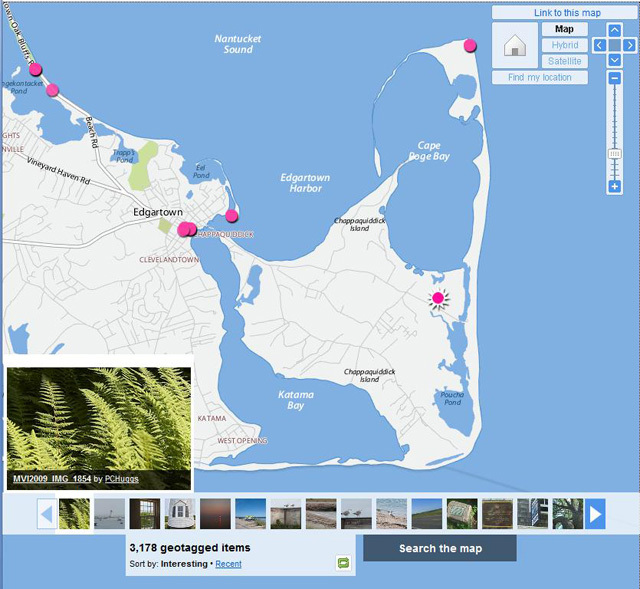 I just manually locate these images (using GeoSetter) to the center of a nearby town. The logger doesn’t work well (if at all) indoors anyways. This entry was posted on 5 January 2010 at 6:51 pm	and is filed under Technology. You can follow any responses to this entry through the RSS 2.0 feed. You can leave a response, or trackback from your own site.